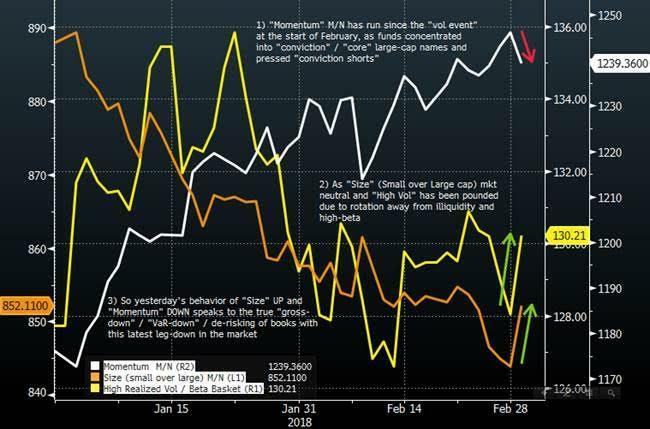 Nomura: What Is Happening Is The Fed Unloading Their "Short Vol Position"
I have concerns about more purchases. As others have pointed out, the dealer community is now assuming close to a $4 trillion balance sheet and purchases through the first quarter of 2014. I admit that is a much stronger reaction than I anticipated, and I am uncomfortable with it for a couple of reasons. [W]hen it is time for us to sell, or even to stop buying, the response could be quite strong; there is every reason to expect a strong response. So there are a couple of ways to look at it. It is about $1.2 trillion in sales; you take 60 months, you get about $20 billion a month. That is a very doable thing, it sounds like, in a market where the norm by the middle of next year is $80 billion a month. Another way to look at it, though, is that it’s not so much the sale, the duration; it’s also unloading our short volatility position. Ah yes, unloading the Fed's "short volatility position". "And I think there is a pretty good chance that you could have quite a dynamic response in the market. " And now, as Nomura's Charlie McElligott explains, that is where we find ourselves in this market noting that this week's volatility (think downside pressure) was much-more than a "tariff trade" in stocks, as we have noted. McElligott details that this move was also about an escalation of buy-side risk management in a “new era” of volatility, as global central banks - led by the Fed - are now committed to trying to de-leverage investors from the perverse risk-taking incentives that they have built into the market through their GFC-response. Without question, the USD reversed its earlier squeeze and traded meaningfully lower again on the Trump “protectionist” concerns “actualizing” was real and continued overnight... and BELIEVE ME, any potential for a “301 tariff” (intellectual property) “trade war” escalation (Trump stated this morning on Twitter - “trade wars are good, and easy to win.”) into the consumer electronics space would cause SERIOUS pressure in the ultra-overweighted Tech sector, instance... and with it, US stocks would get smoked, as Tech is 25% of SPX nowadays. Recent weeks since the “idiosyncratic” equity vol spike (which without question was rooted in a number of “real” macro inputs), fund risk-management of exposure / leverage has looked pretty “ textbook” in the sense of the “buy-the-dip” era where “taking down net (exposure)” during market selloffs has killed your performance on the “V-shaped” snapback recoveries. So instead, you rotate your length into a “liquidity” focus. Let’s use the equity hedge fund space as an example, where with the exception of the most extreme “risk-down” days, clients have by-and-large rotated into their “highest conviction” / “core” mega cap names due-to their LIQUIDITY (stuff you can “get out of when you need to”), while reducing exposure to names and trades that screens the wrong way from a risk manager’s perspective—illiquid / high implied- and realized- volatility / small cap / high beta stuff. Thursday however saw that trend reverse with actual and significant “gross-down” style de-risking - meaning accounts selling-down their favorite longs (in this case, “crowded” large-cap names in the most popular “momentum” sectors (Industrials, Financials, Tech and Healthcare make up 64% of the overall S&P weighting which have become the aforementioned “hiding place”), while at the same time covering shorts / underweights in the “worst” risk-manager stuff (illiquid and volatile) - as such, the S&P’s five worst sector performers YTD (IRONICALLY, the what used to be considered the “defensives”- / “bond-proxy”- / “low volatility” sectors: REITS, Energy, Telco, Utes, Consumer Staples) just so happened to be the S&P’s five best-performing sectors on the session yesterday. A similar expression, illiquid and high-beta small cap (IWM) outperformed the liquid and lower-vol large cap (SPY) by ~120bps yesterday—the third-largest “small over large” outperformance of the past year, on account of this “pure” de-risk. 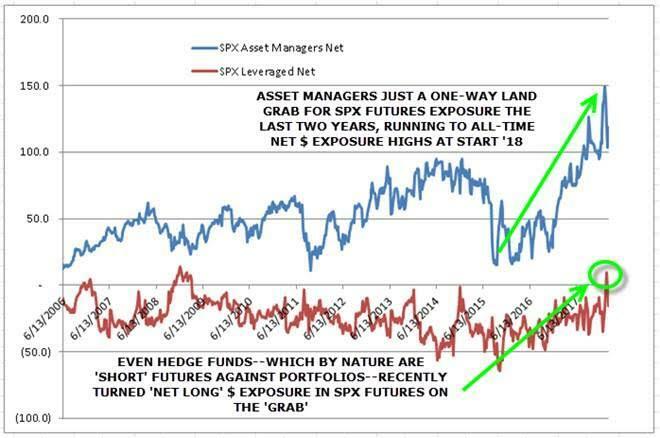 THIS is the “new normal,” as “lazy longs” are no longer a “thing”... index, asset-class, or single-name - because the entire post-crisis period built upon the edifice of “low nominals, flat curves, and suppressed volatility” in order to incentivize investor moves out onto the risk-curve to create a wealth effect from financial asset inflation is in the process of being unwound. You simply have to trade much more dynamically now. 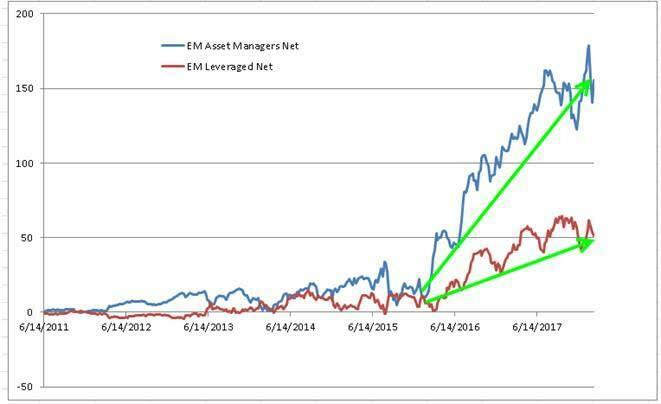 Yesterday’s trade was further representation of institutional investors evolving their risk-management approach in the “new normal” of volatility. 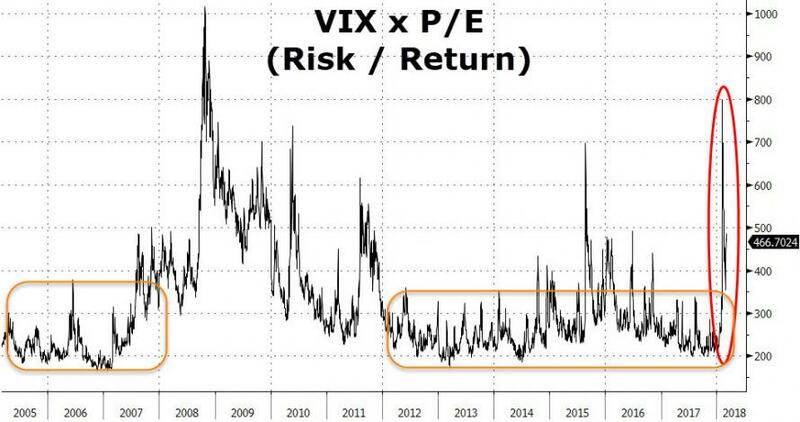 Both buy- and sell- side desks are trying to understand “risk-sizing” and volatility-allocation with this reintroduction of honest-to-goodness price-movement, after the past 5+ years of trading behavior which required negligible concern and created tremendous complacency and incentivized “negative convexity”- / “short vol”- / “leveraged-carry”- strategy proliferation, as central banks and investor thirst for yield facilitated the massively vol suppressing “debt for buybacks” binge. Now, with rates forced-higher by central bank normalization and inflation “escape velocity,” tightening financial conditions are driving higher cross-asset vols as the term-premium is reset higher. Circling back to where we started, the “full reset” of the “Fed Put” concept from new Chair Powell is occurring AND very importantly investors are being forced to derisk and deleverage into this “new normal” vol world that we find ourselves in. McElligott concludes by pointing out that the Fed Put isn’t gone...but it certainly has been “struck lower,” and the market is looking for the price in light of this recently wobble in the collective risk-psyche.